Sondra Lipton, a New York Citybased artist and business executive, paints exquisite still-life oil paintings on board and oils on paper. Her still lifeswhich focus on fruits, flowers, breads, vegetables, objects, and porcelains beautifully arranged and painteddraw on the traditions of Flemish and French still lifes of the 17th and 18th centuries. Handsome burled maple frames showcase her still lifes. She has shown in New York, London, Dublin, Caracas, Dallas, San Francisco, Washington, D.C., and Los Angeles. New Yorks famed Tiffany store windows featured her art. 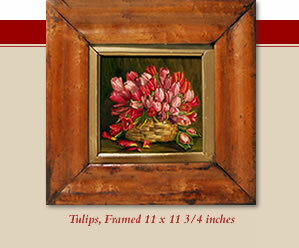 Lipton has appeared on ABC, NBC, CBS talk shows discussing her still lifes. Her work is owned by noted collectors.